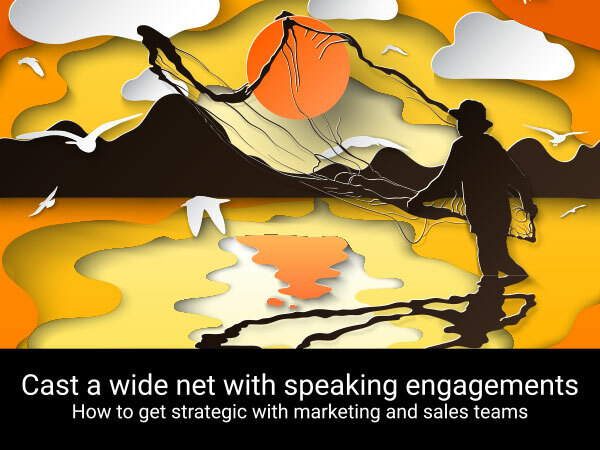 Are you casting a wide net – being strategic with marketing/sales teams when it comes to speaking engagements? So you’ve got a great topic. You have a subject matter expert willing to speak. Now what? WAIT! No, really – hang tight. There are three more questions to ask if you want your speaking abstract to support your revenue goals. Have you thought through the sales/marketing strategy behind your speaking engagements before you submit abstracts? What do you want to accomplish with your speaking engagements? Speaking engagements are an important part of your content marketing strategy. Typically, the content for speaking abstracts is content repurposed from something in your marketing content arsenal…or vice versa. They can drive PR opportunities, lead generation, thought leadership, career advancement and credibility. Speaking sessions are also a proven tool to showcase your subject matter experts, increase social media traffic or simply perfect your public speaking ability. Whatever your motivation, don’t let the marketing and sales opportunities from speaking engagements slip through your fingers. Increase your sales targets – Talk to your sales team. What are their targets? Are they challenged in a particular area of the country or with a particular buyer persona where a speaking session could build credibility? Map out the specific targets with your sales team and research speaking venues for those geographical areas and audiences. Improve PR opportunities – Speaking engagements automatically provide an excellent PR and trust-building opportunity. You have a captive, willing audience listening to what you have to offer. When possible, find out who was in attendance and continue to communicate with them through lead nurturing and other content outreach. Also invite the media to attend your session. Editors cover educational sessions during conferences—invite them to yours! Generate Leads – Collaborate with the show coordinator where your abstract was selected to see if there are other opportunities to increase visibility including: sponsorship, networking or advertising. And definitely be present at the session and other events you sponsor. Think of every moment as a lead generation opportunity! Leverage Content Options –Always provide your audience with a take-away item from your presentation. It can be a simple quick tip sheet, lessons learned, infographic, or case-study recap. Audiences appreciate the additional resource and sales teams value the potential lead opportunities. Build Credibility – Speaking opportunities are an excellent way to build credibility. If you are looking to improve thought leadership for one of your subject matter experts, speaking opportunities are an excellent start. Make sure they are prepared and rehearsed to receive high marks after their session and pave the way for then next speaking opportunity. The better the speaker, the higher the demand for future sessions. Speaking engagements allow for unique marketing and sales opportunities, plus the ability to showcase your expertise. By casting a wide net, you reel-in promotional opportunities, generate new leads, garner media cover, build credibility, and extend your brand exposure to wider audiences.